Is a good chance the wood framing termite damage in the picture above was caused from water wicking up the stucco over a long period of time. This problem would be caused in some older homes that did not have a weep screed to allow the moisture to drain out of the stucco properly and not absorbed into the stucco from the ground moisture. 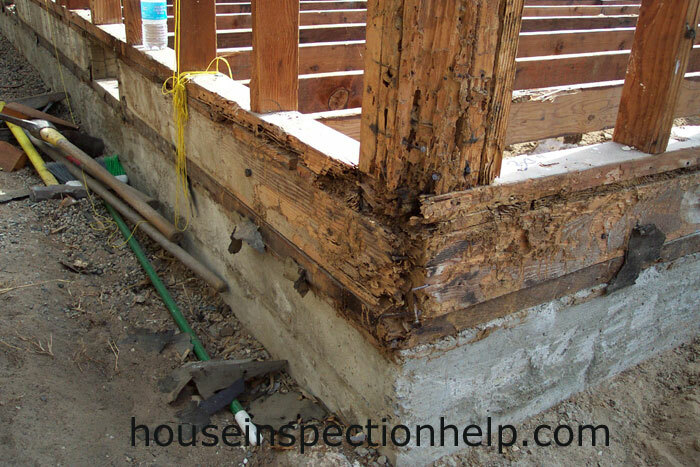 Termites love moisture and wood, remember this. If you have an area of your house that is shaded constantly, a window that always has moisture or condensation on it, a roof that is continually leaking moisture early in the morning from the condensation that forms on the roofing or any water leaks these concentrated areas of moisture could attract termites and cause damage to the house structural framing.